It’s difficult enough to create a character audiences love. Getting us to fall in love with a gigantic, red half-demon is a real challenge. Comic artist Mike Mignola pulled it off, however, when he created Hellboy in 1993. The character has appeared in several comic book series, and two live-action feature films. Now it’s time to evolve. Next spring, Hellboy blasts back onto the big screen in a new incarnation. There’s a new star, David Harbour of STRANGER THINGS, and a story that turns more towards the sinister than previous movies about the character. In short, the new HELLBOY will be a completely new interpretation of the character. Here’s why it looks like such an enticing reinvention. 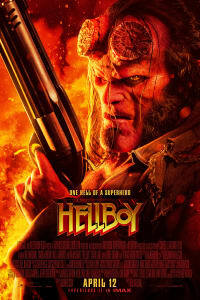 The original live-action HELLBOY hit theaters in 2004. Guillermo del Toro directed the PG-13 film, with Ron Perlman starring as the half-demon hero. It’s a superhero film, but one with dark and gothic undertones. Towards the end of WWII, Nazis used black magic to summon a demon in a last-ditch effort to defeat the Allies. The baby demon they ended up with fell into Allied hands, and was raised to be the relatively good-natured Hellboy. Thanks to his upbringing among humans, the red-skinned demon had an affinity for helping people. In the 2008 sequel HELLBOY: THE GOLDEN ARMY, however, he starts to question his place in the world. Del Toro returned to direct, with Perlman and many other primary cast members also back in their roles. THE GOLDEN ARMY has more fantasy influence than the first film, with a huge collection of creatures and a plot featuring goblins and elves. Guillermo del Toro also planned a third film, but the development was complicated. The filmmaker ultimately backed away from the project. Perlman didn’t want to star without del Toro directing, so the series took a new turn. Creator Mignola acts as screenwriter for the new movie, with Andrew Crosby. This year’s HELLBOY is based on three comic book story arcs: Darkness Calls, The Wild Hunt, and The Storm and the Fury. Mignola urged the creative team to dive into the dark depths of the unlikely hero. With Neil Marshall as director — he’s known for THE DESCENT, and episodes of GAME OF THRONES and WESTWORLD — there’s every reason to expect an intense experience. 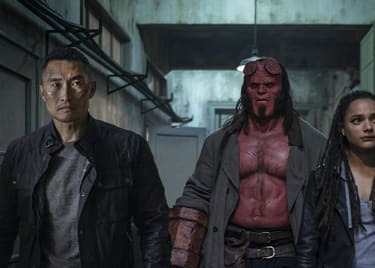 After an ancient medieval sorceress emerges to destroy mankind, Hellboy gets involved in a battle between humans and the supernatural. In addition to having David Harbour in the lead role as the rugged demon, there’s a whole new cast. Ian McShane plays Trevor Bruttenholm, who raised Hellboy after finding him as a baby. 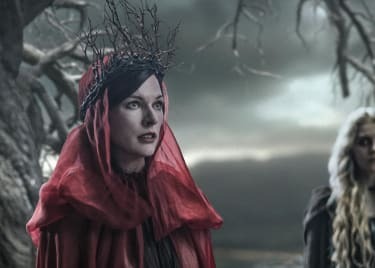 And Milla Jovovich gets the fun task of playing Nimue, the Blood Queen — aka the “ancient medieval sorceress” we just mentioned. Rounding out the supporting cast is Daniel Dae Kim as Ben Daimio, who can turn into a jaguar. Sophie Okonedo is Lady Hatton, a seer in an ancient group called the Osiris Club, which investigates supernatural mysteries. Alistair Petrie plays Lord Adam Glaren, a high-ranking member of the Osiris Club. Brian Gleeson plays the wizard Merlin, and Sasha Lane appears as Alice Monaghan, an Irish woman who was kidnapped by fairies as a baby. Given Neil Marshall’s involvement, we’re hoping for some gore, too. But this demon child, summoned by Nazis but raised as an unlikely angel, has a grand destiny. Problem is, even after proving himself time and again, he’s seen as a monster. That has an effect. Hellboy’s internal darkness will spill over into other aspects of his life. Having to save people who want nothing to do with him certainly won’t help. We can’t wait to see how this new screen incarnation of the character deals with all the horrors of his life.